Several reports have evaluated the dosimetric characteristics of diverse high-density materials: Lead, a combination of lead and bismuth,  tungsten,  copper,  cerrobend,  and tin. These comparative studies suggest that lead or a cerrobend is the best skin collimator from a dosimetric perspective. However, some new materials such as Gamma Putty are more easily fabricated and shaped than lead or cerrobend. In brief, Gamma Putty is a nonhardening, reusable material that has been used as temporary gamma radiation shielding during reactor maintenance, permanent shielding for cable tray penetrations, and industrial radiographic film masking. Gamma Putty is a lead-free material that our clinic [Figure 1] uses for skin collimation because it is nontoxic, malleable, and readily available commercially. Another product made by Radiation Products Design, Inc., called Thermo-Shield, is a bismuth-loaded plastic with density 4.2 similar to Gamma Putty. Shielding the organ at risk is vital in radiation therapy because there is a strong interaction between the electron beam and any high atomic number material. The electron beam produces bremsstrahlung radiation that attenuates the dose along the central axis (CAX) and scatters to organs under the shield. The intensity of bremsstrahlung radiation is proportional to the square of the atomic number of the scattering material. Therefore, it is desirable to have less thickness of shielding material so that the dose to the patient's skin due to bremsstrahlung radiation is insignificant. For electron beam therapy, the most important aspects of the treatment are immobilizing the patient, keeping the beam perpendicular to the surface, and choosing appropriate shielding material. 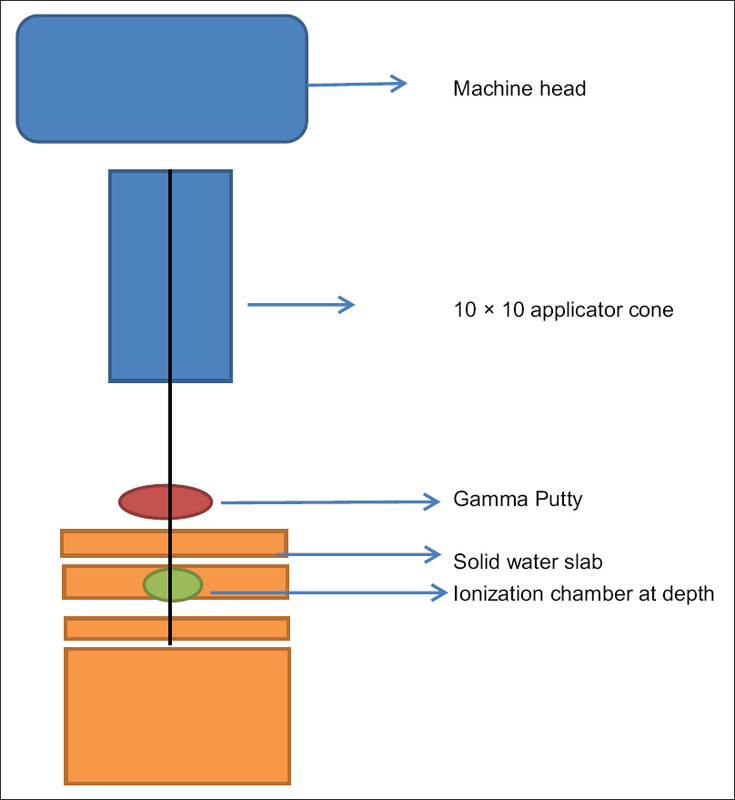 This study assesses the clinical potential for using Gamma Putty as a shielding material for electron beam therapy when irradiating small lesions. Gamma Putty (Shieldwerx, Rio Rancho, NM, USA) is sold as a block in the nonsoluble form of elemental bismuth (90% by weight) with a density of 3.8 g/cc. It can be formed without the need for impressions or molds. Its consistency is malleable enough that the putty closely follows the contour of the treated area. A shield formed from Gamma Putty can have small openings to shape the electron beam incident on the patient. Organs at risk can be shielded during radiation therapy by placing the custom-fitted radiation shield on the chosen area of the patient's body. The Gamma Putty must be thick enough to stop the primary electrons and reduce the transmission of dose to critical structures surrounding the tumor. 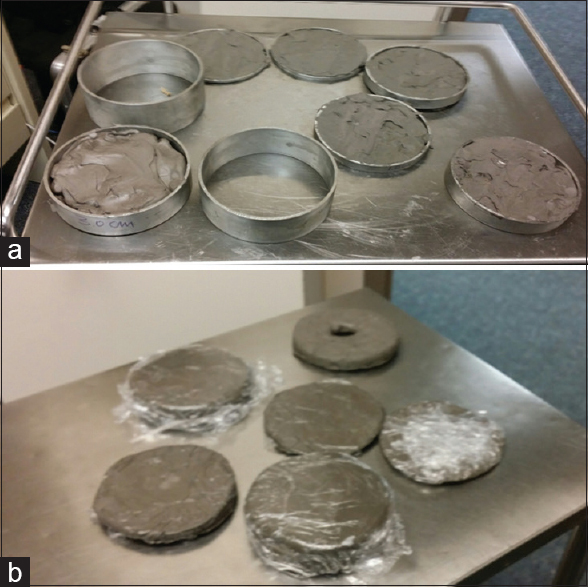 The Gamma Putty samples used in this study were slabs of uniform thickness (3, 5, 10, 15, 20, and 25 mm), shaped, and measured using stainless steel rings wrapped in plastic as shown in [Figure 2]a and b. The physical characteristics of Gamma Putty are listed in [Table 1]. A schematic of the experimental set-up is shown in [Figure 3]. All measurements were made along the CAX of the beam produced by the accelerator. Measurements were made at different depths below the Gamma Putty shield inside a Model 458 solid water slab (Gammex, Inc., Middleton, WI, USA). The solid water slab is l0 cm thick to allow for suitable backscatter. The transmitted intensity is measured in terms of the charge induced in a Farmer and Semiflex-type ionization chamber (PTW Freiburg, Germany) positioned inside the solid water slab. The beam was generated with a 10 cm × 10 cm applicator cone. The ionization chamber data were collected using an electrometer (CNMC 206, Nashville, TN, USA) in open and blocked beams. In addition, measurements were taken to assess scatter from the inside surface of Gamma Putty shields used as a skin collimator, with small, circular holes cutout of the putty ranging from 2 to 5 cm in diameter. These measurements were performed for all available electron energies and Gamma Putty thicknesses. Scattering measurements were made at the depth of 1.5 cm for the 6 MeV and 20 MeV beams, 2.0 cm for the 9 MeV beam, and 2.5 cm for the 12 MeV and 16 MeV beams. This set of measurements was also made along the CAX of the beam. One hundred monitor units were given each time, and all data are expressed as relative ionization (RI) doses defined as: the ratio between dose with Gamma Putty and the unblocked open field at maximum dose (d max ). In this work, we evaluated for each Gamma Putty thickness, the percent transmission defined as the ratio of charge measured for under shielded Gamma Putty over the unshielded open beam. This percent transmission is plotted as a function of thickness for open beam [Figure 4] and shielded [Figure 5]a-e. [Figure 4] shows a high-dose enhancement at the surface. In contrast, [Figure 5]a-e show the transmission curves under a Gamma Putty shield, normalized to the maximum reading in each series of depth measurements for several different thicknesses of Gamma Putty (t = 0, 3, 5, 10, 15, 20, and 25 mm). These curves are similar in meaning to the curves of [Figure 4]. Without any Gamma Putty attenuator, the ionization can increase beyond 100% (the surface dose) before decreasing. With the Gamma Putty attenuator, the d max on the CAX occurs closer to the surface. These curves become shallower as the thickness of Gamma Putty increases or the beam energy increases. From the graphs, one can see a marked difference between the shielded and unshielded fields for all electron energies under consideration. The difference between the shielded and unshielded RI at shallow depths is more pronounced for higher energy beams (12-20 MeV). Furthermore, the shielded beam profiles have similar shapes, with two major sections: A steep gradient, followed by a bremsstrahlung tail. The tail is an extended exponential region, which is more pronounced at higher thickness. This relationship is similar to that observed in a study performed by Prasad et al. using tin and lead as shielding materials. The exponential tail is primarily due to the bremsstrahlung component of the transmitted radiation, whose contribution increases with beam energy and the atomic number of the shielding material as shown in [Figure 5]a and b, for beam energies of 6, and 9 MeV, respectively. The RI curves through shielding material for various electron energies were measured with an ionization chamber placed at various depths in a solid water phantom. However, the maximum transmitted RI occurs at a point close to the skin surface, for any Gamma Putty thickness. The effect of the Gamma Putty thickness on the RI at a depth near the point of the maximal dose was illustrated in. [Figure 6]a and b for low- and high-energy beams, respectively. For instance, when measuring RI at a fixed depth of 5 mm in the solid water phantom for a beam energy of 6 MeV [Figure 6]a, a peak is observed for the 5 mm thickness of Gamma Putty. The RI decreases for 10 mm, then gradually increases with the thickness of the shielding. For more energetic beams (9 MeV and 12 MeV in the same figure), the trend of RI increasing with Gamma Putty thickness is more consistent. However, a different pattern emerges for the high-energy beams (16 MeV and 20 MeV). Here, the RI decreases sharply with Gamma Putty thickness, reaches a minimum at 10 mm (for the 16 MeV beam) or 15 mm (for the 20 MeV beam), then increases rapidly again. This behavior implies that for thicker shielding, the bremsstrahlung scattering becomes more pronounced to significantly increase the dose. 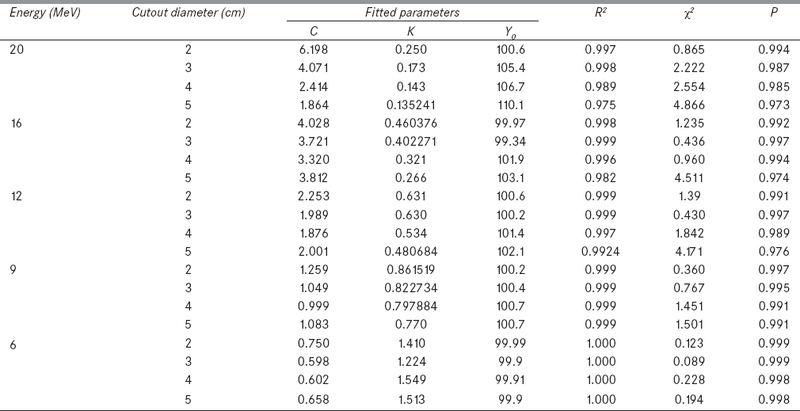 [Table 2] summarizes the relative percentage ionizations measured at 5 mm depth, expressed as a percentage of the surface dose, for all beam energies and Gamma Putty thicknesses. All beams were generated with a 10 cm × 10 cm applicator cone. The optimum thickness of Gamma Putty was determined by plotting the log of RI against depth [Figure 5] for different energies, at each thickness tested. As previously mentioned, the RI profiles clearly divide into two regions: First, the ionization decreases rapidly in the phantom; then, it decreases slowly as the primary radiation is replaced with the bremsstrahlung component. To highlight the inflection point between the two regions, we present the data in semi-log plots [Figure 7]a-f. For more than 15 mm of Gamma Putty, the bremsstrahlung component dominates the ionization for all depths and beam energies. A 15 mm of Gamma Putty is enough to stop most of the primary radiation so that the bremsstrahlung component is not overwhelmed at shallow depths. Beyond this thickness, additional shielding is not needed. Bismuth (chemical symbol Bi, atomic number 83) is a heavy metal. Using it as a shielding material will cause beam hardening; therefore, decrease the absorbed radiation dose. The bremsstrahlung radiation we observe in the phantom is mostly composed of photons originating in the head of the linac, and this radiation undergoes attenuation in the Gamma Putty. Rustgi  suggested that the bremsstrahlung component derived from the phantom is only about 10% of the bremsstrahlung originating in the head. 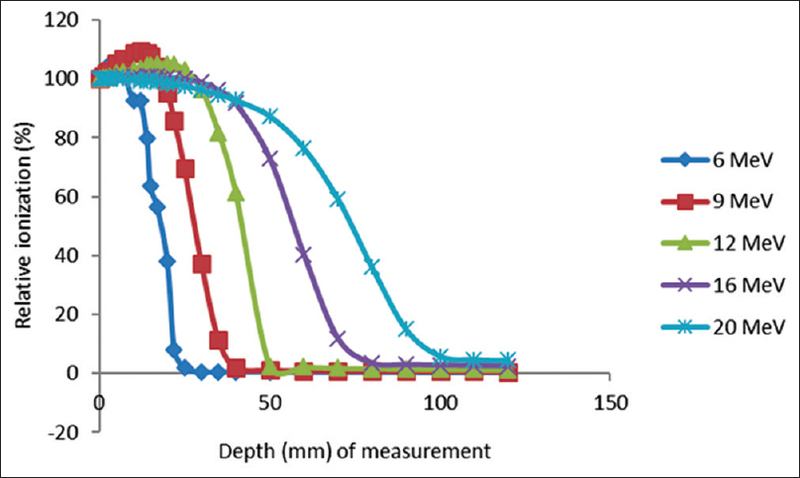 For Gamma Putty thicknesses >15 mm, the bremsstrahlung component dominates over the whole measurement range for 6 MeV and 9 MeV beams. For higher energies (12-20 MeV) and a thickness >15 mm, the minimum depths are 10-14 mm before bremsstrahlung occurred. However, for electron energies, 16-20 MeV, dose reduction to the level of 5% is not feasible due to the bremsstrahlung production in high-Z materials, both in the machine head and in the Gamma Putty. To decrease transmission to the level of 5%, 16 and 20 MeV electron beams require additional shielding to supplement the Gamma Putty. C is a constant defined as the Gamma Putty thickness increases. [Figure 8]a-e shows the fitted RI variation as a function of above parameters. The fits were performed using a combination of exponential function (1) and χ2 statistics, which was used to test the goodness of fit between measured data and the values obtained from equation (1). The χ2 values relative to the expected values for a 95% confidence level that the two sets of data are similar (the null hypothesis) are presented in [Table 3]. It revealed R2 of 1.000-0.998 for all energies and diameters considered. In addition, χ2 (degrees of freedom = 6 P < 0.05) = 12.592 is higher than that listed in [Table 3] and showed that equation is suitable for correlation RI and above parameters. For high-energy beams 16-20 MeV, the RI along the CAX depends on both Gamma Putty thickness and the cutout diameter. The change in depth dose for higher energies is due to the large angular scattering of the electron beams. The thicker the Gamma Putty, the lower is the RI along the CAX. For thickness ranging from 3 to 15 mm with 20 MeV beam, the RI dropped by 44%, 64%, 67%, and 74% for cutout diameters of 2, 3, 4, and 5 cm, respectively. The 16 MeV beam shows similar dependence: The ionization dropped by 22%, 27%, 42%, and 50% for cutout diameters of 2, 3, 4, and 5, cm respectively. This is because the side scatter contribution on the CAX decreases as the distance between the edge of the Gamma Putty and the CAX increases. Zhang et al. reported that in narrow fields, the dose from the cutout has a larger bremsstrahlung tail than in wide fields due to the abundance of high-energy electrons striking the cutout in the former case. In addition, for high-energy beams and small field sizes, the abundance of contaminant photons depends on both beam energy and cutout size and is larger for small field sizes. In this study, the RI along the CAX at d max depends on the electron beam energy, field size (cutout diameter), and Gamma Putty thickness. The effect of the cutout diameter is not substantial for energy beams (6, 9, and 12 MeV) as illustrated in [Figure 8]a-c. The RI levels off after 5 mm of thickness, regardless of cutout diameter. The impact of cutout diameter shielding on output factor was analyzed by Faddegon and Villarreal-Barajas  and suggested an underestimation of dose output to the amount of 1% or 2% due to collimator effect. The effect happens when an electron is scattered through or from the internal surface of the cutout. This effect is amplified as the internal surface area of the cutout increases. It is presumed, however, that variations in the shape of the inside surface (as the result of irregular cutouts) would produce complicated variations in the dose distribution. Our results are comparable to those of Paliwal et al.,  where 0.5-1.0 cm thermos-shield thickness is adequate to achieve a one-tenth value thickness (TVT) at 4, 6, and 9 MeV. The atomic number ratio of Gamma Putty to lead is 1.01 (=83/82), which implies a range of 2-4 mm for lead. For higher energies (16-20 MeV), the TVT for Gamma Putty is about 15 mm, compared to lead which is about 11 mm. The aim of this study was to find an effective and inexpensive material for electron beam shielding. Using a beam modifier shield protects organs at risk surrounding the tumor, but also creates changes in the subsurface dose distribution because of photon scattering. This study evaluates the effects of Gamma Putty samples on transmission along the CAX, and measures changes in transmission due to shielding thickness, beam energy, and the diameter of a circular cutout to shape the field. The d max on the CAX did not change significantly with the diameter of a circular cutout for the 6, 9, and 12 MeV electron beams. At higher energies (16-20 MeV), however, the dose on the CAX increased with both electron beam energy and cutout diameter for the same thickness of Gamma Putty. A 3 mm thickness of Gamma Putty was adequate to provide shielding with 5 half-value layer (HVL) attenuation for the 9 MeV and 6 MeV electron beams. Likewise, 5 mm is sufficient enough for an intermediate energy 12 MeV. For higher beam energies (16 MeV and 20 MeV), 5 HVL attenuation could be achieved using 15 mm of Gamma Putty. The RI measured at d max under a Gamma Putty collimator depends on several factors, including electron beam attenuation in the Gamma Putty, side scatter from the inside surface of the cutout, and the bremsstrahlung photon contamination. As the energy of the electron beam increases, the changes in the CAX depth-dose curve with field size become more pronounced. Particles scattered from the insert edges have sufficient energy to get to the point of measurement, leading to a balance between the out-scatter electrons, and in-scatter electrons (from the insert edges) nearly maintaining constant particle fluence at the depth of measurement. It was also shown that changes in output are due predominately to electrons pathways where they scattered in air, phantom, and jaws. For lower energies, angular scattering is a predominant factor. In addition, it is important to emphasize that as the cutout size decreases the photon contamination increases, due to electrons releasing bremsstrahlung while stopping in the cutout. Furthermore, this study reveals that for a given beam energy and cutout size, we can accurately represent the relationship between RI and Gamma Putty thickness with an exponential fitting function. These functions are provided for all combinations of beam energy and cutout diameter considered here. Gamma Putty, because of its flexibility, has a significant advantage over lead for shielding. To date, there is no literature about the use of Gamma Putty materials in radiotherapy. Cerrobend blocks are used extensively in radiation therapy but are plagued with disadvantages as reported by several studies. ,, However, further work is required to assess the dose distribution behind the protected area as well as to complete comparative studies with existing shielding materials. Levitt SH, Purdy JA, Perez CA, Vijayakumar S. Technical Basis of Radiation Therapy: Practical Clinical Applications. 4 th ed. Berlin: Springer; 2008. Khan FM. The Physics of Radiation Therapy. 3 rd ed. Philadelphia, PA: Lippincott Williams & Wilkins; 2003. Khaledy N, Arbabi A, Sardari D. The effects of cutouts on output, mean energy and percentage depth dose of 12 and 14 MeV electrons. J Med Phys 2011;36:213-9. Zhu TC, Das IJ, Bjärngard BE. Characteristics of bremsstrahlung in electron beams. Med Phys 2001;28:1352-8. Inaba K, Ito Y, Suzuki S, Sekii S, Takahashi K, Kuroda Y, et al. Results of radical radiotherapy for squamous cell carcinoma of the eyelid. J Radiat Res 2013;54:1131-7. Fitzpatrick PJ, Thompson GA, Easterbrook WM, Gallie BL, Payne DG. Basal and squamous cell carcinoma of the eyelids and their treatment by radiotherapy. Int J Radiat Oncol Biol Phys 1984;10:449-54. Farahani M, Eichmiller FC, McLaughlin WL. New method for shielding electron beams used for head and neck cancer treatment. Med Phys 1993;20:1237-41. Khan FM, Gibbons JP. Physics of Radiation Therapy. 5 th ed. Philadelphia: Lippincott Williams & Wilkins; 2013. p. 256-308. Wang CH, Willis DL, Loveland WD. Characteristics of ionizing radiation. Radiotracer Methodology in the Biological, Environmental and Physics Sciences. Englewood Cliffs, NJ: Prentice-Hall; 1975. p. 39-74. Dimitriadis DM, Fallone BG. Compensators for intensity-modulated beams. Med Dosim 2002;27:215-20. Tajiri M, Sunaoka M, Fukumura A, Endo M. A new radiation shielding block material for radiation therapy. Med Phys 2004;31:3022-3.
du Plessis FC, Willemse CA. Monte Carlo calculation of effective attenuation coefficients for various compensator materials. Med Phys 2003;30:2537-44. Prasad SG, Parthasaradhi K, Bloomer WD, Al-Najjar WH, McMahon J, Thomson O. Aluminum, copper, tin and lead as shielding materials in the treatment of cancer with high-energy electrons. Radiat Phys Chem 1998;53:361-6. Rustgi SN. Dose distribution under external eye shields for high energy electrons. Int J Radiat Oncol Biol Phys 1986;12:141-4. Zhang GG, Rogers DW, Cygler JE, Mackie TR. Monte Carlo investigation of electron beam output factors versus size of square cutout. Med Phys 1999;26:743-50. Faddegon BA, Villarreal-Barajas JE. Final aperture superposition technique applied to fast calculation of electron output factors and depth dose curves. Med Phys 2005;32:3286-94. Paliwal BR, Rommelfanger S, Das RK. Attenuation characteristics of a new compensator material: Thermo-Shield for high energy electron and photon beams. Med Phys 1998;25:484-7. Ezzell GA, Orton CG, Maughan RL, Spicka JT, Vitalis TJ, Herskovic AM. Practical aspects of transmission cord blocks in radiotherapy. Med Phys 1987;14:400-5. Boyer A, Biggs P, Galvin J, Klein E, LoSasso T, Low D, et al. Basic Application of Multileaf Collimators. Task Group 50. Madison, WI, USA: AAPM; 2001. Du MN, Yu CX, Symons M, Yan D, Taylor R, Matter RC, et al. A multileaf collimator field prescription preparation system for conventional radiotherapy. Int J Radiat Oncol Biol Phys 1994;30:707-14.